Located in zone 2 is a leafy affluent central London suburb with host of restaurants/bars. Mainline trains and Tube links to centre London. Trains to Waterloo are every 5 to 10 minutes making it easy into central London. Free Parking within the courtyard, Electric gates, cosy fire, quite location and high ceilings. Tucked away down a private driveway, you’ll come to a gated residential courtyard. Nestled under the clock tower arch you’ll find the entrance to The Gate House on your left. 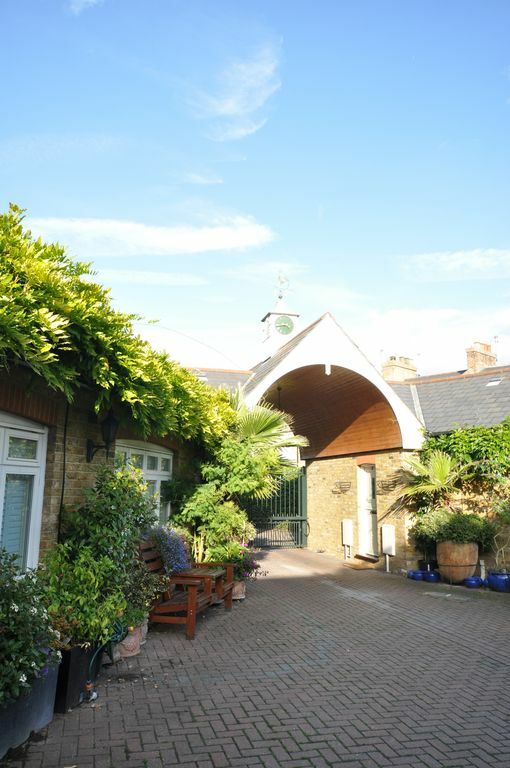 This property is ideal for those with mobility problems or young children as the home is spread across one floor with only a single step into the property. As you walk in and turn right you will find the lounge with vaulted ceilings, windows onto the courtyard and sky lights, there’s comfortable sofas, a coffee table and a dining table with seating for 4 people with a galley a kitchen just off to one side. The kitchen has a washer/dryer, dishwasher and a fridge/freezer. We provide a few essentials to get you through till the next day so you don’t have to worry about needing to shop as soon as you arrive. Off of the lounge is first bedroom you will find a double bed with fresh bedding and wardrobe with hangers. Retrace your steps to the front door and turn left you ll find the second bedroom again another double bed with fresh bedding and built in wardrobe with hangers. Returning to the hall the remaining door is the bathroom we have provided clean towels and bathroom essentials again enough so you don’t have to worry about shopping till the following day. Great site and real comfort. Everything perfect . Thanks Barbara. Looking forward to a return trip in June. Third stay as good as ever. This was our third stay at the courtyard and it was as enjoyable as ever. We have stayed in 3 different houses at the Courtyard and found all of them to be safe, clean and comfortable. The accommodation is suitable for all types of visitors and the location is perfect. We would unhesitatingly recommend a stay. Great location. Safe neighborhood. Close to buses and tube. Home very comfortable. Owner and caregiver of property were very accommodating and helpful. Home on quiet pedestrian lane. Home very clean and had everything we needed. Close to buses and tube. Lots of pubs and places to eat nearby. I definitely recommend! Wimbledon was our reason for our accommodation in Putney so The Gatehouse was perfect. Only 2 stops to Southfields station and a 10 minuets walk to Wimbledon. Many places to dine and drink near Putney Bridge overlooking the Thames. Definitely recommend. We loved staying at the Gatehouse. This is about 30 minutes outside Central London - close to 2 stations that go into London. The House was the perfect size for our family, clean, convenient, and our host Barbara was wonderful. Putney is a nice area with plenty of restaurants, and shops. We will definitely remember this place for our next trip to London! Second year we have stayed here on business/pleasure and once again enjoyed every minute. Plenty of restaurants and pubs nearby and easily commutable to central London. The house has all your home comforts and is nicely tucked away from the hustle and bustle. See you next year.